We present a case of extradural hemorrhage, a rare and unusual complication associated with Sickle Cell Disease, from Nizwa, Oman. A 12-year old male child with Sickle cell disease (SD) was admitted to hospital with backache and pain in both lower Limbs. Clinical examination revealed an average built child with mild pallor, mild tenderness in the lower back and both legs. Rest of the examination was unremarkable including the Central Nervous System. The next day, the patient developed generalized convulsion and became unconscious with shallow breathing. CT of the brain revealed large extradural hemorrhage with shift of mid line structure. After prompt neurosurgical and a hematologic intervention, the child survived and is making progress in rehabilitation. Primary hemorrhagic stroke is a known but uncommon complication of sickle cell disease in childhood, but extradural hemorrhage is an even more rare complication. From the Department of Pediatrics, Nizwa Hospital, Nizwa, Sultanate of Oman. Address correspondence and reprint request to: Dr. Muhammad J. Azhar, Department of Pediatrics, Nizwa Hospital, Nizwa, Sultanate of Oman. Sickle cell disease is among the most prevalent hematological disorders in Oman. It is an autosomal recessive disorder characterized by abnormal hemoglobin S synthesis. It is associated with many complications including cerebro vascular stroke. Ischemic stroke is the most common type of childhood stroke in natural history studies of sickle cell disease, but interventions such as transcranial Doppler screening and chronic transfusions are now making the incidence of ischemic stroke decline.1,2 Accordingly, primary hemorrhagic stroke, a known but uncommon complication of sickle cell disease, will increase in importance as a cerebrovascular complication. Most hemorrhagic strokes in sickle cell disease are subarachnoid or intraventricular. The risk factors for hemorrhagic stroke are; older age, low steady state hemoglobin concentration and high steady state leukocyte count.1 Other proposed risk factors include previous ischemic stroke, moyamoya lesions, cerebral aneurysms, acute chest syndrome (ACS), acute hypertension, hyper transfusion,3-9 and antecedent treatment with steroids. However, extradural hemorrhage (EDH) is an even more rare complication, for which too few reports are available to identify the risk factors. A 12 year old male with SCD-SD, presented with backache and pain in both legs. There was associated history of poor oral intake and mild Upper Respiratory Tract Infection (URTI), with no fever or cough. He was born at full term after uneventful delivery, and diagnosed with SCD-SD by HPLC. The child had multiple blood transfusions in the past, the last being four months ago, but no history of acute chest syndrome (ACS). The child was on Hydroxyurea for the last 18 months (at 15 mg/kg/day) because of frequent blood transfusion. He was a class five student and was doing well at school. He was born of a first-degree consanguineous marriage. His two younger siblings also have sickle cell disease. His father also had SCD-SD, and died of stroke (with similar incident) a year ago but no cranial neuro-imaging was done. The patient was an average built tall child, who came walking, oriented but dehydrated with mild pallor and tenderness in the lower back and the limbs. His initial vital signs were stable, including blood pressure 110/75 mm of Hg (<90% centile). Abdominal examination did not reveal any hepatosplenomegaly. The rest of the systemic examination including neurologic examination was unremarkable. The child was commenced on intravenous hydration with IV 5% dextrose water with 0.45% normal saline, and Tramadol and Morphine infusion for management of severe pain. On the next day, the child had sudden generalized convulsion and became unresponsive with shallow breathing, he was then found to be hypertensive (blood pressure: 121/88 mm of Hg (>95th percentile). Pupils were asymmetric; the right pupil was dilated (4 mm), non-reactive to light and the left pupil (2 mm) had sluggish reaction to light. He had generalized hypertonia with exaggerated deep tendon reflexes with bilaterally up going Babinski reflex. Investigations (after first seizure) revealed leucocytosis with neutrophilic predominance (18.7 k/ul), anemia (Hb: 8.34 g/dl, MCV: 75 fl, MCH: 26.9 pg, MCHC: 34.9 g/dl), mild thrombocytopenia (platelets: 133 k/ul), and high reticulocyte count (8.5%). Coagulation profile showed mild derangements (PT: test/control 24/17 and INR 1.4, APTT was normal). Renal function tests were normal. Hemoglobin electrophoresis showed 90% in S/D/G region (HbF quantitation was not done). At discharge, the child was fully conscious, obeying simple commands, tolerating oral feeds along with left sided visual impairment and left sided hemiparesis. The child was under regular follow up for neurology, physiotherapy, hematology clinic and has been placed on regular exchange transfusion for secondary prevention of stroke. In 18 months of follow-up, on a regular monthly exchange transfusion program since his stroke, he showed good response to rehabilitation services. He still has left sided hemi paresis but strength has improved and he can walk with support, vision in his left eye is still impaired. No new neurological events have occurred. His parents were counseled about the risk of hemorrhagic stroke in the other siblings. Unfortunately, we do not have magnetic resonance facilities for screening angiography. The Cooperative Study of Sickle Cell Disease (CSSCD) defined stroke as an acute neurologic syndrome due to vascular occlusion or hemorrhage in which neurologic symptoms lasting for more than 24 hours.9 Overall, the prevalence of stroke in all forms of SCD was 4%. The cumulative risk of first stroke in SCD-SS was 11% by 20 years. This stroke risk is enormously higher than the combined incidence of hemorrhagic and ischemic stroke in general sample of American children from 14 years of age, which is reported as 3.3/100,000/year. Cerebrovascular stroke is one of the known but serious and devastating complications of Sickle cell disease (SCD), mainly ischemic.1,2 Primary hemorrhagic stroke is one of the most devastating complication of SCD and has a reported mortality of 24-65%.1,2 Infarctive strokes are relatively more common in children than adults, while the reverse is true for hemorrhagic stroke. In CSSCD report, 5 (9.6%) of 52 first strokes in SCD-SS patients less than 20 years were hemorrhagic, while 14 (52%) of 27 first stroke in those over 20 years of age were hemorrhagic.1 Our patient was SCD-SD and there were too few subjects with SCD-SD in the CSSCD to have statistical meaning. 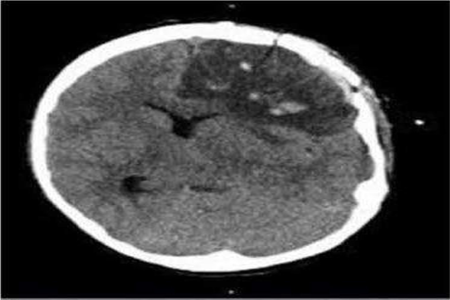 In children with SCD, subarachnoid and intraventricular hemorrhages are responsible for more than half of hemorrhagic strokes compared with about a third in the general pediatric population.9 Extradural hemorrhage as a manifestation of stroke is extremely rare and uncommon. 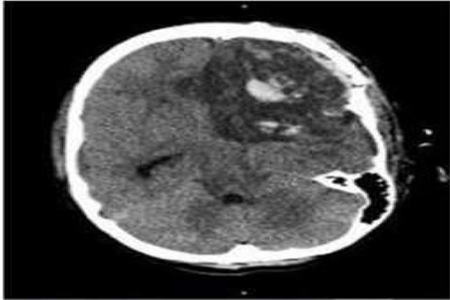 In summary, this is an unusual case of extradural hemorrhagic stroke (non traumatic) in a child with sickle cell disease SD, part of a consanguineous kindred with a father with SCD-SD who had fatal hemorrhagic stroke. The child survived after extensive supportive care, including prompt neurosurgical and hematological interventions, and was making progress in rehabilitation 18 months later. Reports of similar cases may provide new insights on the etiologies of hemorrhagic stroke in SCD. Hemorrhagic stroke is among the emerging challenges in SCD care, because screening and preventive transfusions are reducing ischemic stroke, therefore, more attention should be directed towards the nuance of hemorrhagic stroke. Particular thanks to Prof Olufemi Jaiyesimi and Dr Lewis Hsu for review and valuable suggestions. Fullerton HJ, Wu YW, Zhao S, Johnston SC. Risk of stroke in children: Ethnic and gender disparities. Neurology 2003; 61:189-194. Wang WC. The pathophysiology, prevention, and treatment of stroke in sickle cell disease. Curr Opin Haematol 2007; 14(3):191-197. Hene-Frempong K, Weiner SJ. Sleeper LA, Miller ST, Embury S, Moohr JW, et al. Cerebrovascular accidents in sickle cell disease; rates and risk factors. Blood 1998; 91:288-294. 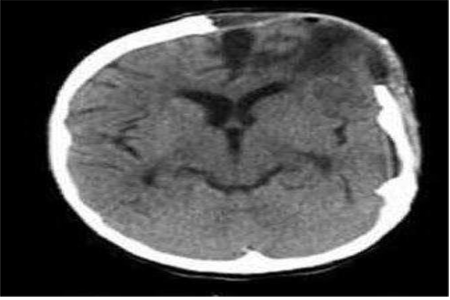 Browne GJ, Lam LT. Isolated extradural hematoma in children presenting to an emergency department in Australia. Pediatr Emerg Care 2002; 18(2):86-9012. Cabon I, Hladky JP, et al. [Uncommon etiology of extradural hematoma].” Neurochirurgie 1997; 43(3):173-176. Guillaume D, Menezes AH. 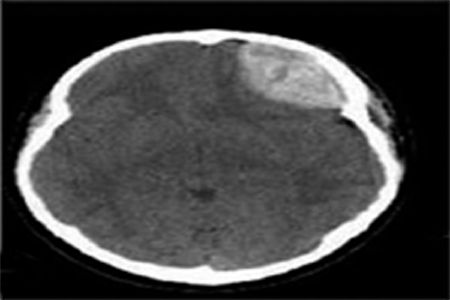 Retroclival hematoma in the pediatric population. Report of two cases and review of the literature. J Neurosurg 2006; 105(4):321-325. Malik NK, Makhdoomi R, Indira B, Shankar S, Sastry K. Posterior fossa extradural hematoma: our experience and review of the literature. Surg Neurol 2007; 68(2):155-158. Cabon I, Hladky JP, Lambillotte A, Cotton A, Dhellemmes P. Uncommon etiology of extradural hematoma. Neurochirurgie 1997; 43(3):173-176. Dobson SR, Holder KR, Niettert PJ, Laver JH, Disco D, Abboud MR. Moyamoya syndrome in Childhood sickle cell disease: predictive factors for recurrent Cerebrovascular events. Blood 2002; 99:3144-3150. Powars D, Adams RJ, Nicholas FT, Milner P, Charache S, Sarnaik S. Delayed Intracranial hemorrhage following cerebral infarction in sickle cell anemia. J Assoc Acad Phys 1990; 1:79-82. Malik, N.K., R.Mukhdoomi.et.al (2007).Posterior fossa extradural hematomoa: Our experience and review of literature.Surg Neurol; 68(2):155-8. Royal JE, Sealer RA. Hypertension, Convulsions and cerebral hemorrhage in sickle cell anemia patients after blood transfusions. Lancet 1978; 2(8101):1207. Stockman JA, Nigro MA, Mishkin MM, Oski FA. Occlusion of large Cerebral vessels in sickle cell anemia. N Engl J Med 1972; 287:846-849. Henderson JN, Noetzel MJ, Mckinstry RC, White DA, Armstrong M, Debaun MR. Reversible posterior encephalopathy syndrome and silent cerebral infarcts are associated with severe acute chest syndrome in children with sickle cell disease. Blood 2003; 101:415-419. Keyrouz SG, Diringer MN. Clinical review: Prevention and therapy of vasospasm in subarachnoid hemorrhage. Crit Care 2007; 11(4):220. Tsomi K, Karagiorga-Lagana M, Karabatsos F, Fragodimitri C, van Vliet-Konstantinidou C, Premetis E, et al. Arterial elastorrhexis in beta-thalassaemia intermedia, sickle cell thalassaemia and hereditary spherocytosis. Eur J Haematol 2001 Sep; 67(3):135-141.